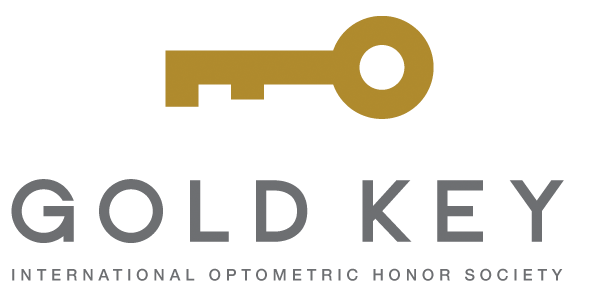 The Gold Key Society was established in 1965 by the student council at the Southern College of Optometry for the purpose of recognizing upper-classmen who demonstrated outstanding professional and ethical attitude through leadership and service to their class, college, and profession. In 1972 the society became independent of the SCO student council and established itself as the leadership honor society of all schools and colleges of optometry. To reflect the society’s new status the name was changed to The Gold Key International Optometric Honor Society. At the AOSA Congress of 1974 in Philadelphia, members were selected and chapters started at four other institutions: University of Houston College of Optometry, Pacific University College of Optometry, Southern California College of Optometry, and University of Alabama College of Optometry. At the 1976 AOSA Congress three more chapters were established at Indiana University College of Optometry, Illinois College of Optometry, and Massachusetts College of Optometry (known today at New England College of Optometry). Today, over thirteen schools and colleges of optometry are represented in the Society, with more schools colonized each year. Selection to the society is based on leadership, scholarship, and value to the class, college, and profession and membership is limited to no more than ten percent of one class. To recognize optometry students who demonstrate leadership to their class, college, and profession.